Marten de Jongh - Interactive documentary following the life of Peter. The story of Peter (Het verhaal van Peter) is an interactive documentary to gain attention for the PGB (a personal budget); a budget which people who need extra care get to spend on healthcare and which is about to be changed dramatically by the Dutch government. The goal of this project was to gain attention for the PGB (a personal budget); a budget which people who need extra care get to spend on healthcare. In 2013 there was a lot of negative attention around this topic and the budget ws about to be changed dramatically by the Dutch government. 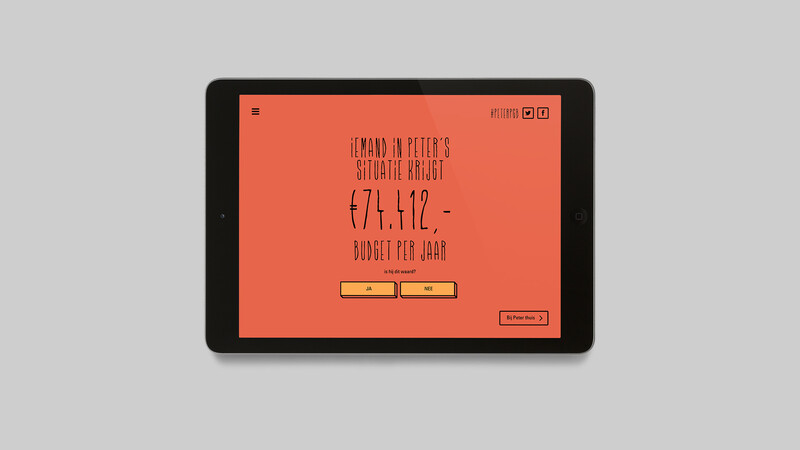 The story of Peter is an interactive documentary which the story of 28 year old Peter, a man with the Dravet syndrom and one of the highest budgets in the Netherlands. Most discussions about the PGB at this point (2013) focus only on cutting budgets, but it leaves out the human side. The goal with this project was multifold: Give the general public an understanding of what the life of someone with a PGB looks like; Provide context to what such a life costs; And most importantly: influence the decision makers in The Hague in order to let them make better choices regarding the future of the PGB. We made a very hard statement: is Peter worth the €74.412 he gets from the government (and thus from society)? After that we go through the different steps of day-to-day life and showing exactly where the money goes to. At the end we ask the same question: is Peter worth it? The first days thousands of people visited the website and saw the documentary. The direct question triggered people and caused a lot of social media attention. The most interesting thing that happened was the impact the documentary actually had on public opinion: The first time 48% voted that Peter was not worth it; After viewing the documentary 92% voted that Peter was worth it So the documentary itself turned 40% of the people from non-believers into believers. With these statistics we contacted the national media. And after a national newspaper (Algemeen Dagblad) paid attention to the topic other media became interested. In three days time the documentary was covered on radio (Radio 1, BNR) and primetime national television (Hart van Nederland, Pauw & Witteman). And in the end Second Chamber politicians even visited Peter and his parents to talk about the topic. Last but not least we won the golden European Design Award with The Story of Peter.